This post is for Bron Marshall's second WILDFOOD blogging event, with a Wild Weeds theme. It is also the very first blogging event in which I have participated, and I think it is fitting that it is an event organised by a fellow Antipodean. I had originally wanted to make wattle seed, macadamia and chocolate chip cookies; however, the only wattle seed at Prahran market (my "local") was a large jar costing $30 - and I only wanted a teaspoon! Weirdly enough, right next door to the wattle seed was a jar of wild hibiscus flowers. These are normally used in champagne cocktails to create a very girly, pink bubbly glass of champagne. I have previously indulged in hibiscus flower champagne at Jade Buddha in Brisbane while passing time between a friend's wedding and the wedding reception. It is a top drop! However, for this blogging event, I thought that the hibiscus flowers would be perfect as gorgeous edible decorations atop individual baked cheesecakes. I chose a low fat baked lime cheesecake, and substituted some of the citrus juice used in the original recipe with the hibiscus flower syrup. I had hoped that the syrup would turn the cheesecakes a pretty shade of pink, but this was not to be! 2. Line a 12 hole muffin pan with paper cases and spray with cooking oil. 3. Crush gingernut biscuits in a food processor until fine crumbs form, then add melted margarine. Press approximately 1 1/2 teaspoons of the biscuit mixture into the bottom of each muffin case. Chill for 30 minutes. 4. Beat cream cheese and ricotta together until smooth, then beat in sugar and 1 tbspn flour until combined. 6. Beat in remaining flour, lime juice, hibiscus syrup and lime zest. 7. Pour cheesecake batter over prepared biscuit bases, and bake for approximately 35 minutes or until the filling is set. Turn off the oven and allow cheesecakes to cool in the oven with the door ajar. 8. Chill cooled cheesecakes in the refrigerator. 9. Just before serving, top each cheesecake with a hibiscus flower that has been doused in champagne or mineral water to open the flower, and a drizzle of hibiscus flower syrup. This cheesecake is quite light, especially for a baked cheesecake. The lime flavour was very subtle, so if you like your cheesecake to be tangy, you could increase the amount of juice and zest that you include in the mixture. I also liked the gingernut base, which complements the lime nicely. You can eat the hibiscus flowers themselves - the makers claim that they taste like raspberry and rhubarb. While I'm not so sure about that, they certainly taste good! Ah, meatloaf - the much maligned and unloved dish often referred to with disgust on TV shows such as Happy Days, and which I confess to loathing as a child. However, as a grown-up, I have rediscovered the joys of a good meatloaf, especially as a comfort food on cold winter nights. I served my meatloaf with "heaven and earth" mash (so named by Nigella Lawson), comprising of mashed potato and apple, tomato sauce (ketchup) and steamed broccoli. My verdict: homely but delicious. For my lunch this week, I made pasta with tuna, tomato and olives from p22 of Tessa Kiros' gorgeous book, Apples for Jam. I fell in love with this book at first site - not only for its evocative title, but because the cover is lolly pink and red and features a photo of perfect little red girl's shoes on the cover. Tessa has subtitled this work as "Recipes for Life", and has classified the recipes by colour (which is so cute!). Each recipe comes with its own story of where it came from and why it is featured in the book, and Tessa's description of the method for each recipe is written like an extension of those stories. This book is absolutely adorable just to gaze at and leaf through, even if you never make anything out of it (which, until now, I hadn't). My photograph of this pasta dish is a little cloudy because the steam from the hot pasta kept fogging up my camera lens. The resulting pasta has a subtle rather than overpowering flavour, which I rather enjoyed. However, I will add more olives than recommended by Tessa if I make it again. Last Sunday night, I was invited to dinner at my friend's place. She has long been appreciative of my baking, so of course I thought that the perfect hostess gift would be baked goods. Given it was a chilly, cold winter evening, I decided to make the a warm, sweet indulgence - and Nigella's steamed syrup sponge seemed just right. The recipe for this sponge pudding can be found at p132 of Nigella Lawson's How to Be A Domestic Goddess. As you can see from the photos, this pudding consists of a beautiful, golden, light and sweet sponge, with its own rich syrupy sauce. The rather unglamorous container into which I upended the completed pudding was necessary so that I could transport it to my friend's house, as Nigella warns that you shouldn't wait more than a few minutes before turning out the pudding once it has finished steaming - presumably because the sauce would solidify and refuse to pour out over the delicious sponge once cool. My friend didn't have any icecream, cream or custard to serve with this pudding, but it was delightful on its own. Even better, there was plenty left for both of us to have another night. This pudding is exceptionally easy to make, and although it takes two hours to steam, it only requires you to check on the water levels every now and again while it is steaming to make sure that the pudding doesn't boil dry. This is the perfect sweet for a chilly winter's evening - it truly warms the cockles of the soul. I have a backlog of things to blog about this week, because I have been frantically trying to write a speech for a conference that I am speaking at in less than two weeks. However, I have continued to bake and cook, and will post the remaining items over the course of the coming weekend. However, given that once again it is baking Friday, in keeping with the Dickensian theme of tales that come in twos, I thought that I would blog about the two very different birthday cakes that I made this week for work colleagues. I also believe that it is relatively low in fat. I echo Niki's comments about the fragility of this cake - the first time I ever made it, I made it in a loaf tin, and it was in grave danger of cracking in two. Accordingly, you cannot be careful enough when turning it out of the cake pan to cool. However, it is well worth the effort - everyone at work commented on how much they liked this cake, despite it not being a traditional birthday cake. Now this is definitely not a pretty cake, and I have no idea how it will taste. It is dead easy to make, with nearly everything being done in a food processor. Under the unusual icing, which consists solely of dates, cocoa and water, one side of the cake went a little tipsy, rising much more than the other side and cracking a little. The recipe for this cake can be found here. You will see that my cake is not half as pretty as the one on the website. However, it is totally dairy free, and the chocolate taste comes solely from cocoa. The website promises that this is "a tasty cake". I hope that it lives up to that promise, despite its unusual ingredients and appearance! Postscript: This cake was a hit, not only for the gentleman concerned, but also for some others, who loved the fact that it was sweet and chocolatey while being relatively good for you! For "baking Friday" this week, I made two slices. My reason for this burst of enthusiasm was that one of the slices contained ginger, which is less of a general "crowd pleaser" among my circle of acquaintance than other sweets. I have no idea why this is - I adore ginger, with chocolate coated ginger being one of my favourite treats, and there's nothing like grated fresh ginger to add a pleasant "zing" to a stir fry. Bearing this in mind, I made Ginger Crunch and Raspberry Coconut Slice. The ginger is really quite subtle, so even if you think you don't like ginger, but like caramel and shortbread, give it a go! It is delicious. Preheat oven to 180 degrees Celsius, and grease a 20cm x 30cm slice tray. Cream butter and sugar, then beat in the egg. Fold in the sifted self raising flour, and press the resulting dough evenly into the prepared slice tray. Spread base with the jam of your choice (approximately 3/4 cup). Both slices seemed to be popular at work, and I still have some just for me and my friends for the weekend because I baked two separate slices. I am even lucky enough to have a friend down from Sydney this weekend with her boyfriend, so I have plenty of opportunities to share the joy. Have a great weekend everyone! As a child, I loved meringues, and as a grown-up, I still do (although now not in my top 5 favourite treats). What's not to like? They're ever so cute with their pastel-coloured, dainty ballerina's tu-tu appearance, with a crunchy coat enrobing their soft, marshmallowy heart which melts in your mouth. I had 5 egg whites left over after Friday's champagne custard making, and thought instantly that meringues would be the perfect way to use them up. Compared with some of the other alternatives I could have used them for, meringues were the easy option, with few ingredients and relatively easy to make. Beat egg whites with an electric mixer until soft peaks form. Gradually add sugar until mixture is white and glossy. Mix the sifted cornflour and vinegar into the mixture. Colour and flavour as desired (or not at all, if you prefer!). Spoon or pipe 3cm rounds of mixture onto baking trays which have been greased or lined with baking paper. Put meringues into the oven and turn the temperature down to 120 degrees Celsius. Bake for approximately 45 minutes, or until the meringues turn faintly golden and have set. Cool in the oven. You can enjoy meringues in their pure, unadulterated form on their own, or served with fruit and cream or icecream. Either way, if you are a sweet tooth, I'm sure that you will love them! I like to bake muffins to take to work for morning tea, as I have previously stated, because they are easy, filling and delicious. This week, I have baked apple, sultana and orange muffins, an "old faithful" that I make quite often. They are relatively low in fat, which is easy on my waistline! The recipe originally didn't contain orange - I added that because I love a bit of zing to my food, although as a child I would have screwed up my nose at anything containing peel and refused to eat it! The zest also gives the muffins a lovely aroma as they are baking and while they are still warm - making them irresistable. Turn on oven to 200 degrees Celcius. Spray a 12 hole muffin tin lightly with oil. Another Friday, another work baking day. This week, I decided to make profiteroles. I absolutely adore these little bubbles of light pastry filled with all manner of delicious things and topped with chocolate, and first tasted them as a child when my mother made them for a treat. It has been a long time since I last had them, and I have previously been too scared to attempt them myself because of the "old wives tale" that choux pastry is hard. However, I was inspired by The Daring Bakers (who recently made Gateau St-Honore, featuring choux pastry) to give profiteroles a go - and I'm glad that I did. I chose to fill my profiteroles with champagne flavoured pastry cream (custard). The recipe is here, from Cheryl of Cupcake Bakeshop. This custard has a subtle "zing" from the champagne/sparkling wine used to flavour it, and makes a refreshing change from your usual pastry cream. The recipe for the choux pastry that I used is Pierre Herme's recipe from p527 of The Cook's Book. 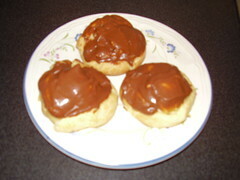 However, I prepared the choux buns from the pastry using the directions from p194 of The Margaret Fulton Cookbook. My completed buns were not as attractive as Pierre Herme's or Margaret Fulton's, but they tasted perfectly fine! Once the pastry cream and choux buns were cool, I filled the hollow in the buns with the pastry cream and iced them with chocolate icing to complete the profiteroles. I chose to ice the profiteroles rather than use chocolate sauce because it made them more readily transportable. I ended up with 18 profiteroles. The verdict - yum! I think my work colleagues agreed - there were only 2 left at the end of the day. I am also no longer afraid of choux pastry, and would happily try it again for a special occasion. One of the people in my section at work leaves us tomorrow - well, sort of. After 2 years, he is taking up a new role in another group in the company, so this Friday's choice of baked goods has been selected by the man himself. The request was for "lemon cheesecake". I am unsure whether this meant baked or unbaked cheesecake, so I have decided to make baked cheesecake, as it is just that little bit harder to make, and therefore more "special" in my eyes. When I searched for suitable recipes, I found that many baked cheesecakes follow roughly the same formula, with minor variations here and there. Accordingly, this cheesecake is not made from any one recipe - I used my research to make a cheesecake that suited my fancy at the time, although any of the other variations would have made just as fine a finished product. Even though the cheesecake turned out beautifully, with no cracks in the top, I decided to top it with a sour cream glaze, and once cooled, to sprinkle it with grated white chocolate. 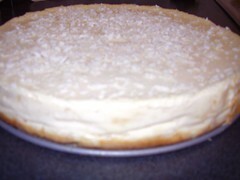 As you can see from the picture, the end result does not make a very tall cheesecake (even though I used the pan size called for in the filling recipe); however, it appears to have turned out well. Mix crushed biscuits and butter together in a bowl, then press into a 20cm springform that has been greased and lined with baking paper. Refrigerate for 10-15 minutes. Beat together the two cheeses until smooth and creamy. It helps to get a smoother result if you chop the cheeses into rough cubes before beating. Combine the sugar, flour and salt in a small bowl, and beat half of this mixture into the cheeses. Add the eggs, vanilla and lemon juice (and zest) and beat well. Finally, beat in the remaining sugar mixture. Pour the filling onto the biscuit base, then bake in the oven for 45-50 minutes until set. Take cheesecake out of the oven and turn up the temperature to 200 degrees Celcius. Beat together the sour cream, sugar and lemon juice. Spread evenly over the top of the cheesecake. Return the cheesecake to the oven for 5 minutes to set the topping, then switch off the oven and leave the cheesecake to cool inside it for one hour. After this time, remove the cheesecake from the oven and leave to cool completely on the bench. Once the cheesecake is cool, refrigerate overnight. Just prior to serving, remove the cheesecake from the springform pan, and grate white chocolate over the top of the cheesecake (optional). This cheesecake had a lovely, smooth texture, and did not taste "eggy". It also did not taste very lemony! If I made this again as a lemon flavoured cheesecake (as opposed to wanting just cheesecake), I would add the zest and up the lemon juice. However, despite my fears about the uptake of this cheesecake, it went down well with my work colleagues, and none was left at the end of the day (no mean feat given that we only served it at 4.30pm). Another work colleague made a lovely strawberry refrigerator cheesecake for the occasion, so all tastes were catered for on the day. I wanted to experiment with making mini meat pies in minii muffin pans. As it is quite cold in Melbourne in winter, meat pies are one of the ultimate comfort foods. There's nothing like biting through rich, buttery pastry into flavoursome, warm meat. As I was taking the pies into work, I didn't want to add vegetables to the filling, as this is not to everyone's taste. However, the fun part was that there is no recipe for the filling - I just made it up as I went along, using taste as my guide. Making the pies in the mini muffin pans resulted in very cute, tiny pies, with only a teaspoon of filling in each. The only problem was that I made way too much meat - the leftovers have been stashed in my freezer to make lasagne at a later date. Sift flour and salt together into a bowl, and rub butter into flour. Add water and lemon, and stir with a knife to form a soft dough. If too sticky to knead, add more flour; if too dry, add more water. Knead dough lightly, wrap in cling film and chill in refrigerator for one hour. Brown onion in frypan, then add mince and brown. Add salt, pepper, tomato paste, sauce and stock. Cook until mince forms a rich, thick sauce. Preheat oven to 190 degrees Celcius. Grease 2 x 12 hole mini muffin pans. Remove pastry from the fridge, and roll out until approximately 3mm thick. Cut out circles of pastry and an equal number of matching tops (I got 16 sets of shells and tops from my pastry). Line mini muffin pans with pastry circles to form shells for the filling. Place one small teaspoonful of meat filling into each shell, then place the tops on each mini pie. Crimp edges of each pie with a fork to seal, and prick the top of each pie once with a fork. Brush tops of pies with either beaten egg or melted butter to help them brown in the oven. Bake for approximately 40 minutes or until pies are golden brown. Remove from oven and serve hot (or cool and reheat later in a microwave). At night, it has suddenly become very chilly in Melbourne, with temperatures falling below ten degrees Celcius. These temperatures call for food that warms the belly and the soul, and one of my favourites for this purpose is chilli con carne. The recipe that I use is from p125 of Eat Well, Live Well with Diabetes. I am not diabetic, but I bought this book because it contains low GI recipes, which are useful for everyone looking to keep their weight in check. The only modification that I make is to add frozen vegetables to the dish. This may make purists balk, but the addition of vegetables means that I end up with a self-contained, all in one dish, and don't have to cook additional vegetables. 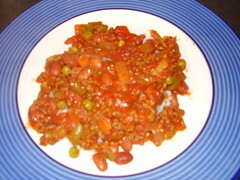 I serve the chilli con carne with boiled rice. This really hits the spot on a cold night- it is spicy without bringing tears to the eyes, and is very filling. In a word - perfect! Today, I attended the Good Food & Wine Show at the Melbourne Exhibition Centre. It was absolutely huge - heaps of people, heaps of exhibitors and, best of all, heaps of food and wine. I was primarily there for the food, so I didn't pay much attention to the wine. However, if wine is your thing, there was plenty of it. I really enjoyed this presentation, as Donna did make it look easy, and I believe that all of the dishes could even be successfully made by yours truly :). Donna also kept the audience entertained by her banter with Stephen, her sidekick, and Wes the cameraman. I also bought two of the magazine goodie bags filled with treats for the bargain price of $5. (Sunday proved a good day to go to the Festival, as being the last day, the goodie bags were being sold for half price). This of course went straight in the bin, as I recently learned that the mould spores penetrate the whole cheese so you can't just cut off the mouldy bit and think that the rest is OK.
Of the many tastings and experiences that I indulged in, special mention goes to The Sofitel's mango panna cotta with orange jelly; Rouiz's white chocolate yoghurt; the groovy plastic kiwi fruit spoon given to us at the door, with a serrated edge at one end to cut the kiwi fruit in half and a spoon at the other end to eat the fruit with; and the warm custard danish from Dan's Danish (which I purchased from the lovely smiley boy manning the stall). I really had a good day out, and would definitely go again. This book is written by one of the doyennes of food blogging, Clotilde Dusoulier, who writes a food blog of the same name as her book. Clotilde's recipes are devine, and she adds special, personal touches to her book by prefacing each recipe with a story of its significance and by taking the gorgeous photographs in the book herself. This book will eventually be on sale in Australia, and I highly recommend it as an addition to your recipe book collection (or just a cracking good read at bedtime! ).